TJ Falcon Series 3 Piggyback Shock Absorbers feature a fixed rate with increased capacity for the oil and gas charge allowing for better performance and less heat buildup compared to monotube shocks. 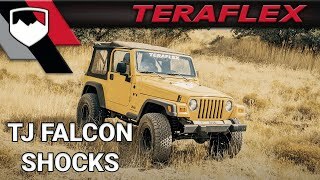 Designed specifically to meet the unique requirements of the Jeep Wrangler, Falcon Shocks have engineered Jeep-specific shock absorbers that deliver increased stability, improved ride quality, and comfort for daily driven Jeeps as well as race-inspired performance, handling, and stability off road. Historically, universal shock absorbers have been adapted to fit many applications with minimal tuning. Falcon Shocks rewrites the book on shock absorber development. Built from the ground up with a focus on fitment and function, our JK Falcon Series 2 monotube shock absorbers and corner-specific JK / TJ Falcon Series 3 piggyback shock absorbers deliver the best damping characteristics possible. After a lengthy and painstaking development process, we have delivered these advanced shocks to the awaiting Jeep market. Front shocks feature a unique piggyback design with the reservoir positioned horizontally to increase clearance with large tires during articulation and turning. The rear shock positions the body and reservoir at the bottom to eliminate shaft damage from rocks kicked up by the tires. 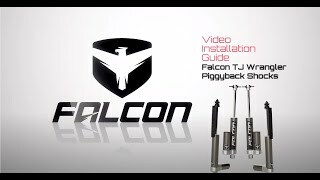 • Adjustable cartridge upgrade kits NOT available for TJ Falcon Series 3 Piggyback Shock Absorbers.